This camera has relatively large 5.86 µm pixels. This enables greater light sensitivity, greater depth of field, and demands less performance from a lens. If configured to use its full resolution, it has an image circle of 13.27 mm and a 1" lens is needed. To instead use a lower cost 2/3" lens, simply configure the camera for less resolution. All the following resolutions can use a 2/3" (11 mm) lens: 1500 x 1126, 1200 x 1200, 1634 x 920, 1440 x 1200. These resolutions can deliver frame rates of 176, 166, 214 and 166 FPS, respectively, depending on output format. Maximum camera frame rate also depends on the output format, exposure time and your network hardware. The frame rates above were calculated assuming short exposure and "raw" Bayer RG8 output. 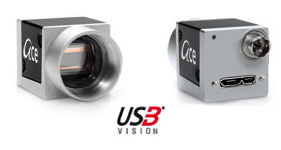 If you plan to de-Bayer images in the camera, this USB3 camera is preferred over GigE because of the additional bandwidth available. This camera has a new FPGA that powers advanced 5 x 5 pixel demosaicing for superior color rendition. 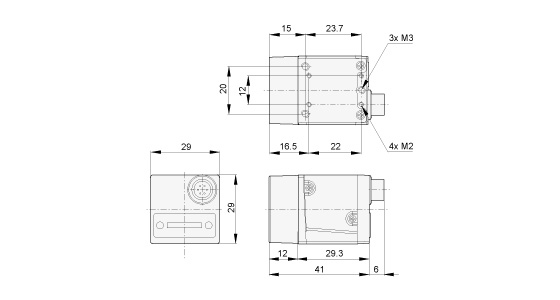 All Basler ace cameras provide a full set of features to address a wide range of applications. Pixel data can be output in 8 or 12 bit depth. You may adjust the camera’s black level, gain, area of interest, input debounce, and trigger delay. It features automatic exposure control, pixel binning, horizontal image mirroring, event reporting, sending of test images, and a programmable lookup table. There are also “chunk” features that include a frame counter, time stamp, trigger input counter, and CRC checksum calculator. Note that not all features may be available when using third-party software.